“Surprising How Good It Is” Pizza – Voila! 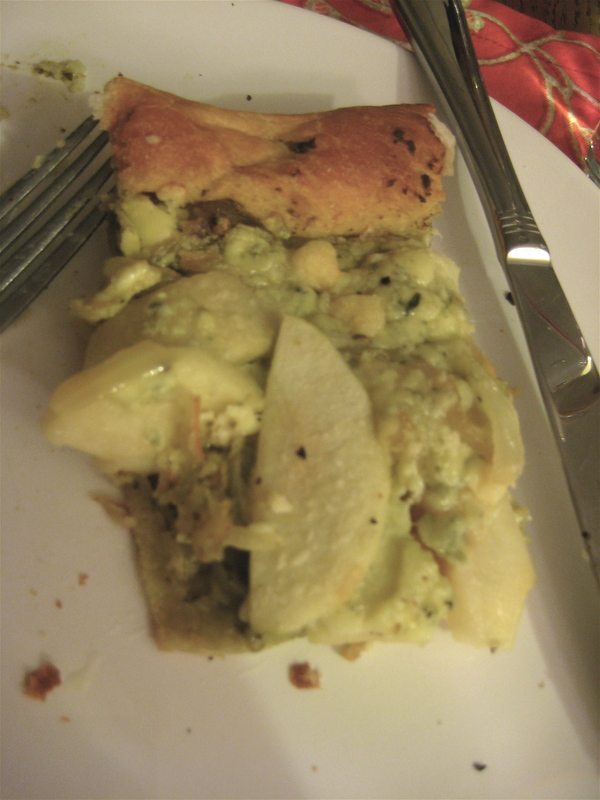 What do you think of when you read: granny smith apples, pesto, caramelized onions and gorgonzola? Do you think, “Yum! I bet that would be a great pizza!” Probably not. Well break those barriers and sink your teeth into this pizza of seemingly incongruous ingredients. I got the original recipe from my friend Kate’s blog (Cooking & Kitchen Stories). But after further research into this alien pizza idea, I combined a few other ingredients and ideas from other food blogs. 1. Roll out dough on to large cookie sheet and spread pesto into thin layer, leaving 1/2 inch from the end of the dough. Tear up slice of cheddar and place around on top. Cook in oven for 5-7 minutes until cheddar cheese melts. 2. Melt butter on medium-low heat, add onions. Cover and let sit for about 20 minutes, stirring occasionally. Onions should be very tender and have a brownish shine. Pour in bowl and set aside. Add another T. of butter and sautee apples for about 5 minutes until soft. 4. Cook for about 15 minutes, or until cheese is melted and slightly brown on top. Voila! The pizza you never thought you’d eat! Previous Post James Makes Dinner! That sounds super yummy. If you ever want to make your own pizza dough, Nathan and I love the thin crust pizza recipe from The Kitchn (on AT) because it doesn’t have to rise. 1/2 tsp yeast, 1/2 tsp salt, 2 cups flour (we use WW) and 3/4 cup water. Easy peasy and oh-so-yummy. Thanks for the shout out! Glad you tried the gorgonzola. Looks great!